This is no mere fusion or run-of-the-mill Thai restaurant. No, Paste Bangkok is much more. 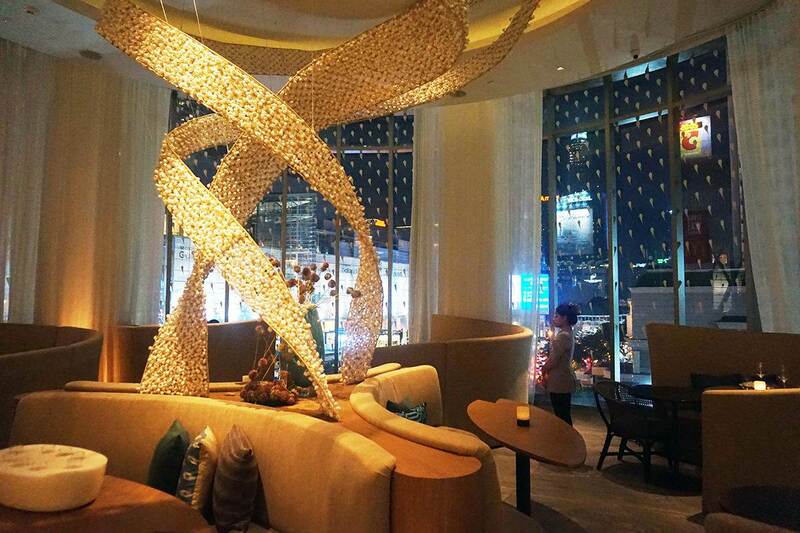 It is built on history, passion and a love for aristocratic Thai cuisine. The recipes and menu are inspired by renowned Thai families and aristocrats that have refined their recipes over many centuries. After the success of the first branch in Sukhumvit 49, Paste recently opened a second, this time hitting the more high-end Gaysorn Plaza in the Ratchaprasong shopping district. This new opening definitely fits their brand culture and ambiance. As soon as you step into the restaurant, you feel a sense of elegance and class. The décor is sleek, stylish and elegant with large half-circle sofas placed in different angles and a large statement piece in the middle. Right next to the entrance is a well-stocked wine cellar and adjacent cocktail bar. When seated, you immediately experience the privacy of your company without having to worry about people watching you eat. This is a really nice touch that most restaurants don’t consider. First, a complimentary appetizer - a rose apple cut in half with roasted coconut shavings and homemade Thai sauce. A perfect blend of sweetness and spiciness really make the flavors complement each other in this dish. 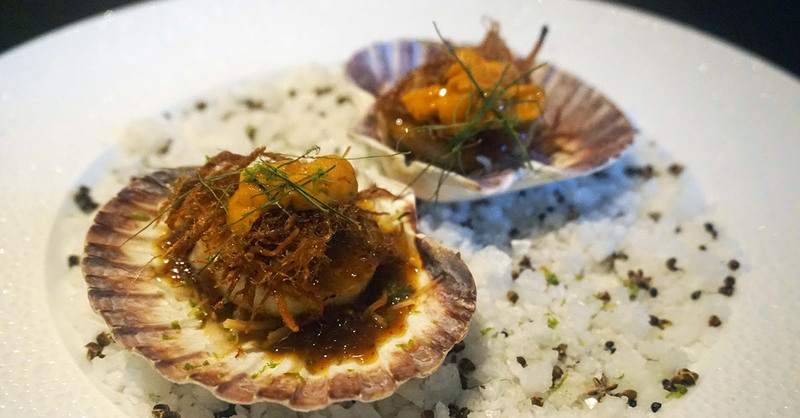 For starters, we were brought a set of Hakkaido scallops and Canadian sea urchin with sweet pork with chili jam and som-saa zest (350 Baht). This had a sweet and sour tangy taste with a hint of spice – sort of like a yum or nam tok salad, but better. This was quickly followed by crispy quall eggs (350 Baht) with organic caviar, cooked in Chinese five-spice supreme master stock, their homemade sauce. The eggs were indeed crispy from the outside but soft from the inside. The taste was slightly less spicy and tangy than the scallops but still a pleasant surprise to the taste buds. There were flavors that we just could not figure out. Next up, two seafood dishes that were just out of this world! First, a twice-cooked chargrilled Spanish octopus (700 Baht) with pineapple, caramelized onions and baby prawn floss (left dish). The octopus was sublimely cooked to perfection and just melted in the mouth. Normally, it is very chewy. Again, similar to a yum salad but with an unexplainable twist. 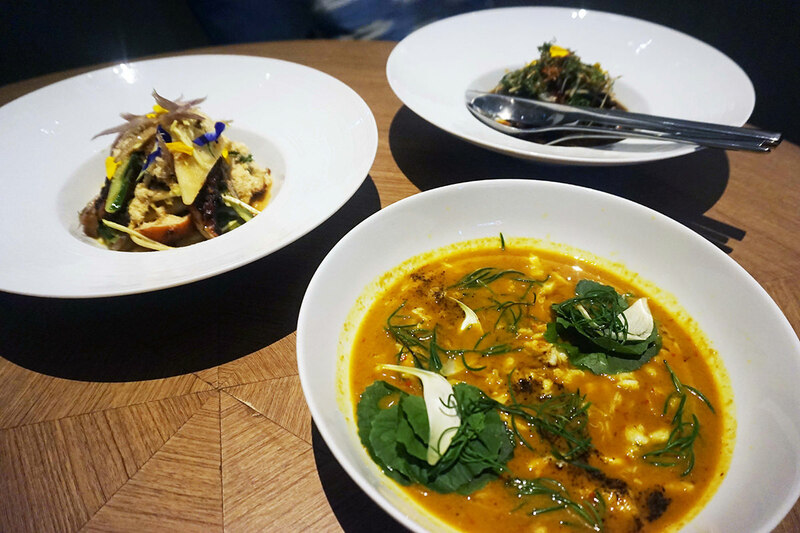 The second dish was a smoked southern Thai curry with blue sea crab (whopping 850 Baht), black pepper, pennywort and sea asparagus (dish on the bottom right). You can literally taste the smokiness in the crab and the curry is well-spiced where it doesn’t overpower the flavor. Finally, we were served a slow-cooked Australian lamb shoulder (700 Baht) in hot and sour sauce with tango mandarin and black vinegar. It was a very, very refreshing dish despite it being heavy because of the lamb meat. It was so well-cooked that it didn’t even require a knife to cut into the meat. For dessert, a special, new item was prepared for us. It’s not on the menu yet because the chef is experimenting with his latest masterpiece. It was a platter of white chocolate ice-cream mixed with shitake mushroom and marangs. On the side were figs, slow-cooked in champagne reduction. This was probably the only fusion item that they had for the day. After the meal, we had a short chat with Jason Bailey, the co-owner and Chef at Paste. He and his wife Khun Bee are the brains, heart and hands behind the delicious and innovative restaurant. Jason explains that despite what people think, Paste is not a fusion Thai restaurant. If anything, he describes it as aristocratic, authentic Thai with “Grand-ma tradition” style. Those are the types of people he would like to impress – the grandparents and foodies who like the true, tried and ancient recipes of the old times. At Paste, although they do innovate and experiment, the inspiration comes from the recipes that were created before the early 1900s. Jason and Khun Bee make it a point to cook their food using local ingredients but with western cooking methods and presentations. “We focus on purity and quality. We make sure every part of our supply chain is top notch” says Jason. He goes on to clarify that they don’t use commercialized or market ingredients to make sure the flavors are as authentic and fresh as possible. Indeed, maybe that explains the unrecognizable flavors. If you’re expecting the same old Thai cuisine you have with traditional dishes like Pad Thai, Tom Yum, and other day-to-day dishes, Paste is probably not for you. But don’t let that deter your visit; it’s a food experience of a lifetime and one that we’ll definitely be trying again. We hope you do too! Shayan is a Pakistani who has studied and worked in Bangkok for over 20 years. Apart from working at the Asian Institute of Technology as a marketing professional, he is also a digital branding and marketing consultant that has transformed his interest in freelance writing. When he’s not doing that, you can find him at the gym or the local bars.